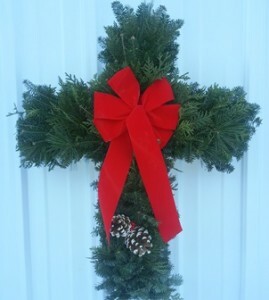 Cross Wreath | Purchase Online | Free Shipping | 218.564.4909 | MN |. This beautiful mixed foliage Cross Wreath consists of balsam fir, white pine and white cedar boughs and is approximately 26″ long. A red velvet bow, white-tipped Ponderosa pine cones and faux Holly Berries decorate this wreath.